An Edwards attack misses the mark. The following invitation just appeared in our in box: "TODAY: EDWARDS CAMPAIGN TO HOST CONFERENCE CALL TO DISCUSS SENATOR CLINTON DISMISSIVELY 'LAUGHING OFF' QUESTIONS ON NAFTA IN LAST NIGHT'S CNN DEBATE." Our first reaction: Who says the blogger's life isn't a glamorous one? Our second reaction: Why do political campaigns hate the shift key? Our third reaction, having actually read the body of the message: Given the existence of videotape and transcripts and all, would it really be so hard for the Edwards campaign to get its facts straight? Searching for something to salvage out of last night's debate, the Edwards campaign says in its e-mail: "Last night, when asked by CNN's Wolf Blitzer if NAFTA was a mistake, Senator Clinton dismissively laughed off the fact that roughly one million American workers have lost their jobs as a result of NAFTA, saying: 'All I can remember from that is a bunch of charts.'" 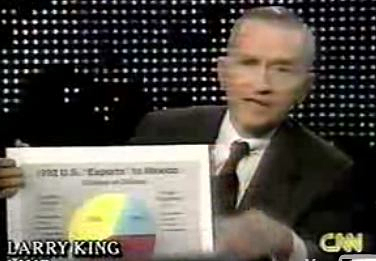 What actually happened: Debate moderator Wolf Blitzer reminded Clinton of "the big NAFTA debate when your husband was president of the United States," and he specifically cited the 1993 debate between Al Gore and Ross Perot on Larry King's show. "A lot of us remember the debate between Al Gore, who was then vice president, and Ross Perot," Blitzer said. "Ross Perot was fiercely against NAFTA. Knowing what we know now, was Ross Perot right?" Clinton laughed and said, "All I can remember from that is a bunch of charts." It was a joking reference to all the pie charts Perot trotted out during the 1993 debate, and last night's audience laughed along. "That sort of is a vague memory," Clinton said, and then she turned to the substance of the issue. "Look," she said, "NAFTA did not do what many had hoped. And so we do need to take a look at it and we do need to figure out how we're going to have trade relations that are smart, that give the American worker and the American consumer rights around the world." A moment later, Blitzer asked Clinton the question the Edwards campaign cites in its e-mail message. "All right," he said. "So let me rephrase the question. I'll rephrase the question. Was NAFTA a mistake? Was NAFTA a mistake?" Clinton's answer: "NAFTA was a mistake to the extent that it did not deliver on what we had hoped it would, and that's why I call for trade timeout. When I am president, I'm going to evaluate every trade agreement. We do need to get back to enforcing the ones we have, which the Bush administration has not done. They have totally abdicated that. "But I think we have to get broader than that. We've got to have enforceable labor and environmental standards. We've got the WTO that enforces financial and corporate rights. We need the International Labor Organization and other mechanisms that will be there to enforce labor rights and environmental rights. And that's what I intend to do as president." That may be short of the answer Edwards and his supporters think the next president ought to give, but it's also a long way away from "laughing off" a million lost jobs and talking about charts.